Am I the only one who always always always gains weight between November and January? It’s very irritating. You’d think with as many treats as I make all year-long, my body would be accustomed to constantly noshing on goodies. But no. Hello spare tire. Back again? Wonderful. Just in time for 1000 pictures with family during Christmas events. So here it is, the second week of January and my resolution to drop those pesky pounds is in full swing. Which means some healthier options for dinner. Thankfully, that does not mean (at least in my world) bland-tasteless-boring food. No. I cannot. Scratch that – absolutely will not – sacrifice flavor just because I’m trying to drop a few. 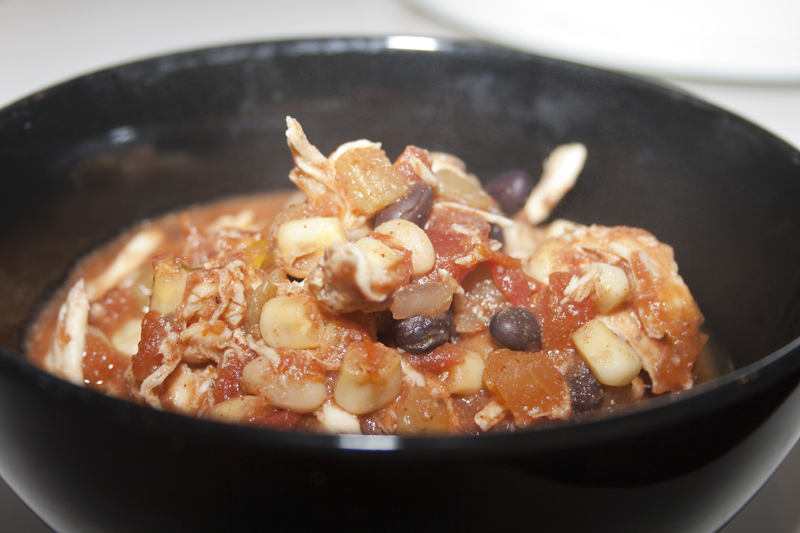 Enter this easy peasy, monstrously delicious chili. It’s the easiest dish in the world. Just throw it all in the crock pot. I use those giant frozen chicken breasts from Costco and put them in straight from the freezer. Cover it up and let sit on your counter all day. The only part you actually have to do anything for is shredding the chicken. Now generally, I use my Kitchen Aid to shred up chicken. Works like a dream. But, you have to allow it to cool a little first – and this is a pop it out, shred it up, and back into the pot kind of deal. So, I use the two fork method. 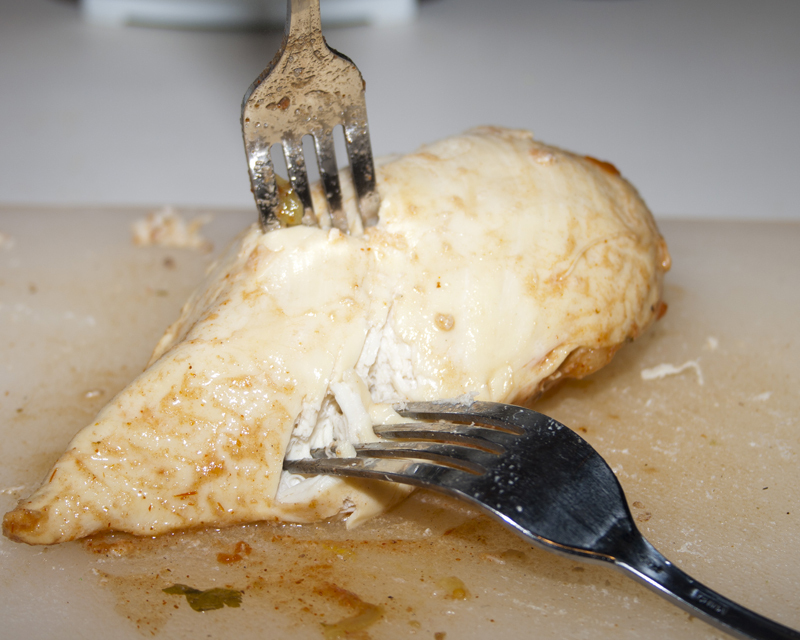 Stab the chicken on top with one fork, hold on to it and then drag a second fork thru the meat. Keep at it. Just stab/pull, stab/pull until you have a pile of perfectly shredded meat to add back to your chili. Boom. I’m not a fan of kidney beans. At least not the red kind. I don’t know why. I can’t explain it to you. I like the white kidney beans just fine and I’m sure they’re exactly the same. 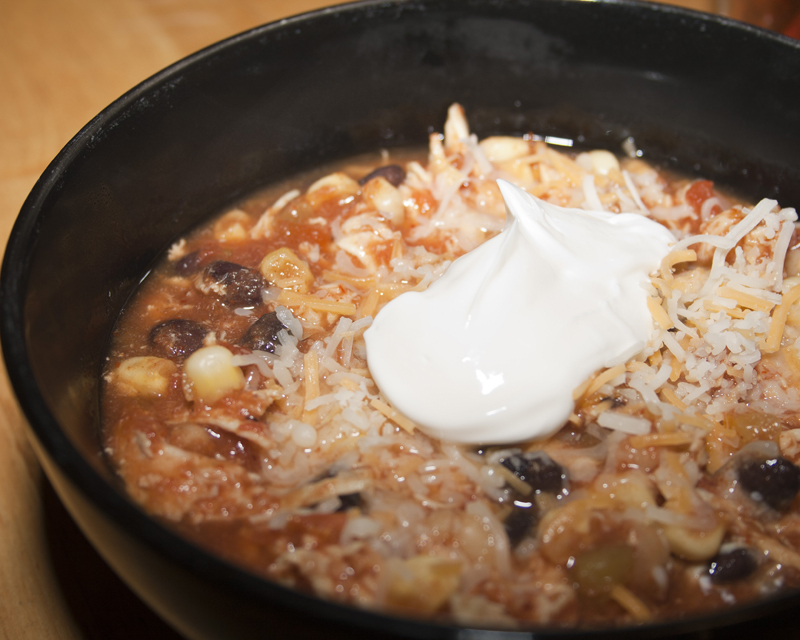 Anyway, those of you with sharp eyes may notice there are white, not red beans in this chili. Feel free to substitute however you’d like. It’ll still be divine. And warm. And oh so filling and hearty. And, at only 200 calories per cup, your New Year’s resolution will thank you. Unless you add cheese and sour cream like the rest of my family did. Then I can’t be held responsible for your waistline. Lucky for my kids, they got my husband’s eat-whatever-you-want-and-don’t-gain-a-pound genes. Or maybe that’s because they are children…who burn off calories by running around all day like little crazy tornadoes of messiness. Yeah, it could be that. Combine beans, onion, chili peppers, corn, tomato sauce, cumin, chili powder and taco seasoning in a slow cooker. Place chicken on top and cover. Cook on low for 10 hours or on high for 6 hours. 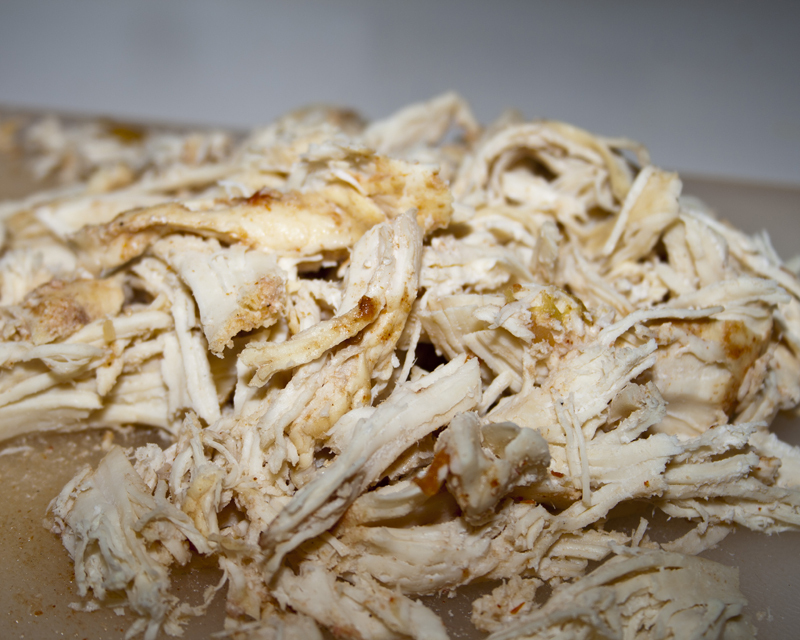 Half hour before serving, remove chicken and shred. Return chicken to slow cooker and stir in. It is suuuuuuper yummy! And yeah, totally low in fat!